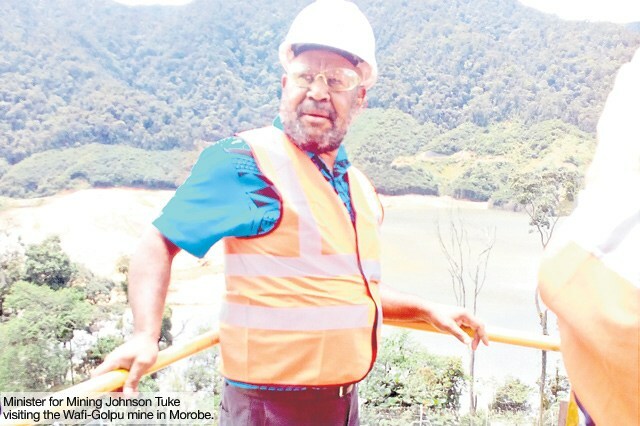 Mining Minister Johnson Tuke is bulldozing ahead with Wafi-Golpu but will landowners demands be honoured? The Peter O’Neill government is committed to getting off the ground the Wafi-Golpu gold mine project before the year ends, as well is the aspirations of key stakeholders to be met as a precedent to the mine reaching initial production stage. The two-day Wafi-Golpu development forum ending yesterday in Lae was told. The main point arising from discussions and presentations between key stakeholders from the government, the landowners and the developer centered on the processes and development stages to the project, as well primarily the benefits and participation of concerned authorities and recognised landowners. One of the key factors presented to be considered in the Memorandum of Agreement that is deemed to provide a win-win situation to key stakeholder is to put a stop to “Fly In, Fly Out” arrangements. The three existing government recognised landowner groups of the mine site including the Babuaf, Yanta and Hengambu Land Owner Associations (LOA) share similar notion when it comes to fly in fly out. President of Babuaf LOA Thomas Nen said it is paramount in this development forum that their stance as a key stakeholder to the project be put forward reminding all parties to the table that Babuaf requested specifically for a mining township that covers no fly-in, fly-outs. Mr Nen said included are a hydro scheme, hospital and technical training college in the requested mining township. He said the MOA must consider endorsing the development vision and aspirations of the communities and that both Hengambu and Babuaf have completed and produced their community development plans stemming from the community development forum in which their community’s aspirations and dreams are spelt out.